Calling all citizen scientists – we need your help! Natural history museums around the world contain billions of insects that were collected over centuries. Each insect is tagged with a label that contains important information about when and where the insect was collected, species and collector names, and other useful data. These data can be used to study insect population ranges, the spread of invasive species, and the response of insects to drought, fire, land use change, climate change, and other environmental disruptions. 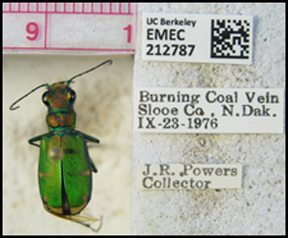 The goal of the CalBug project is to digitize these data and make the information available to everyone. The first step in mapping out the distribution of California’s insects and spiders for the past 100 years is to take a picture of each specimen with its labels. If you live near UC Berkeley and want to help with this step, get in touch with us. The next step is to capture the information from these labels in our database. This is where we really need your help! It’s simple. Go to our Citizen Science web portal, Notes From Nature, and sign in (or sign up). Once you are signed in, select BUGS, and choose a project. You will be asked to fill in the country, state, county, locality, date, collector, and a few other items in an easy to fill out form, while looking at a picture of the specimen and its labels. Click on the link below and start collecting data today! If you have any questions, contact our collection manager (essig.museum[at]gmail.com).